After a bit of a break, we were back at the wonderful Studio in Live Theatre for a very regular JHot show featuring local, then American artists. The evening started with Rhona Darling and her yet to be named two-piece band. Unbelievably it was only their second performance as a unit! With Tom Kimber on mandolin and Bertie Armstrong on banjo lending support to Rhona’s wonderful work on fiddle, and ever more assured vocals the unit made themselves a bunch more friends through a brief, but hugely enjoyable set. I expect this little local combo to become one of the finest of its kind. Everything seems set in place, with a mix of Appalachia learnt fare and carefully homespun songs inspired by family and the North East. 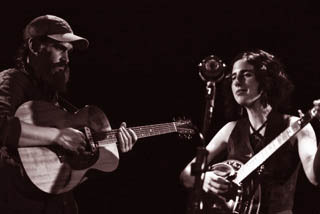 We then had a welcome return to the venue for Americana duo Kendl Winter, and Palmer T. Lee (he grew up in Minneapolis listening to the music of Texas singer-songwriter Townes Van Zandt and John Hartford) whom, opened as expected, playing twin-banjos. With each likewise capable acoustic guitarists and sublime harmony vocalists it mattered little who sang lead, as the evening flowed seamlessly. Palmer reminds me in style such his meticulous fashion of his playing and vocals, of traditional steeped duo Eli West and Cahalen Morison. As for the young lady Kendl Winter & her quirky folk steeped vocal style, on one or two songs I was pleasantly reminded of an early Nanci Griffith. However, that is just a passing observation, because they have their own style and it is a most enjoyable one too. On having an excellent rapport with the audience the couple were able to relax and play as if they were entertaining a bunch of friends, and they do make friends quickly. With tunes and anecdotes coming thick and fast, The Lowest Pair thrilled the faithful with their unique style, and intense manner in which they treat every note and lyric with much care and attention but without fear of losing an audience. Highlights were many as Winter and Lee (I could easily listen to him all night) performed tight harmonies and picking to go with them on obligatory murder ballad, “Darling Corey”, and a song they called “Hang Me”. One that included lyrics from the Danny Dill – Marijohn Wilkin’s all-time classic murder ballad, “Long Black Veil”. Other tales of note included tales about gamblers, a fictitious tale about skewing your life up and one likened to the mid-wife meeting the reluctant mother, and there was more from the Jew girl from Arkansas and Minneapolis singer-songwriter. Among which they revisited an old timey recording by Jerry Garcia and David Grisman. I was happy enough to hear anything from The Lowest Pair. As a special treat…The Lowest Pair invited Rhona & the boys back on stage as a goodwill gesture and a grand finale. 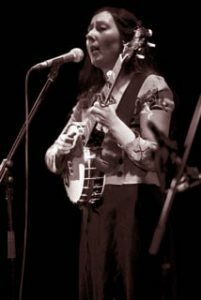 Winter and Lee were so taken by the fact all three could play banjo, and to the delight of the audience they all played the rollicking instrumental “Hunting The Buffalo”, and traditional song “The Blackest Crow”. It worked perfectly …The next time you get to see these two acts play together it may be at a banjo convention!